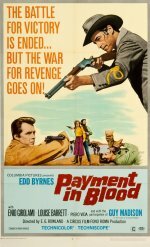 "Payment in Blood" qualifies as a violent, above-average Spaghetti western shoot'em up with a high body count. Like director Sergio Leone's bigger budgeted "The Good, the Bad, and the Ugly," the lower budgeted "Payment in Blood" concerns the quest for buried treasure. The outlaw villains embark on a search for a fabled fortune, approximately $200,000, stashed at an undisclosed location by Confederate General Beauregard.